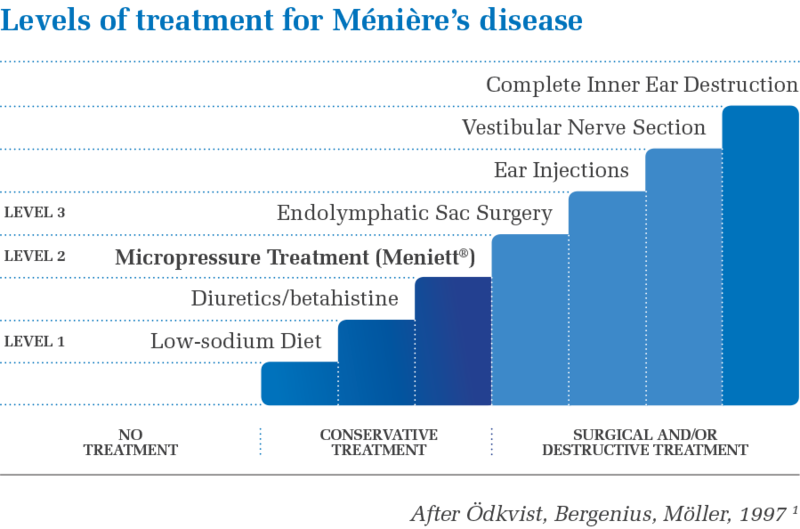 Regular treatments with the Meniett generator reduce the vertigo symptoms of Ménière’s disease and improve quality of life. Most doctors prescribe 3 Meniett treatments a day, 5 minutes each time. The Meniett device is small, portable and easy to use just about anywhere for a short time each day. There is no cure for Ménière’s disease, however, you can manage its symptoms. A low sodium diet and medication help some people, however, for those not getting any relief from their vertigo symptoms, Meniett therapy is the next level of treatment. Meniett therapy is effective for the majority of patients and may help you avoid a more invasive treatment. Meniett therapy is minimally invasive, provides relief from your vertigo symptoms and improves quality of life. Meniett therapy is a minimally invasive treatment of the vertigo symptoms of Ménière’s disease. The Meniett generator delivers a software-controlled, complex algorithm of micropressure pulses through an earpiece held in the outer ear. A ventilation tube in the tympanic membrane allows the pulses to reach the middle ear where they influence the fluid system of the membranous labyrinth through the oval- and the round window. The energy of the pulses displaces the excess endolymph which normalizes the pressure in the ear. Functionality level is an important indicator of a Ménière’s disease patient’s quality of life. Ménière’s disease symptoms are often unpredictable, and some patients experience sudden vertigo attacks so severe that they live in constant fear of another attack. This can be very disabling, significantly reducing quality of life. Ménière’s disease is different in each patient. Based on their individual preferences, many doctors will follow a treatment ladder that starts with conservative therapies before progressing to more invasive treatments. Meniett therapy is a minimally invasive treatment option that may help you prevent surgery or destructive ear injections with gentamicin. Before you begin Meniett therapy for your Ménière’s disease, you need a small ventilation tube placed in your eardrum that allows the micropressure pulses to reach the middle- and inner ear. Ventilation tubes are commonly used in the treatment of ear conditions. Also called a myringotomy, the procedure takes about 10-20 minutes and is usually done in the doctor’s office. There is always a small risk of infection where the tube is inserted, however, your doctor can tell you more about this risk and answer any questions. Your tube will be checked periodically to make sure it is still in place and not blocked. When a ventilation tube is removed, the eardrum usually heals completely. After the procedure, you may be monitored for about an hour. You can usually go home after that if all goes well. You will experience little or no pain but may have a temporary, slight discharge from the ear. Your doctor will give you specific instructions about living with your ventilation tube, including when to get immediate attention and when to schedule follow-up appointments. He or she may also prescribe antibiotic eardrops for a few days.